Special Visit Premium Codes (SVPs) act like a bonus on top of your fee service codes. This incentive is used to compensate physicians who have specific specialties or sub-specialties or who provide care outside of their regular schedule. They can significantly increase your monthly revenue, however they can only be used in conjunction with an appropriate A-prefix consult or assessment fee. SVP’s can also provide you extra earnings if you work on a holiday or weekend, see below for a list of holidays. The Ministry of Health’s Special Visit Premium dates observed. 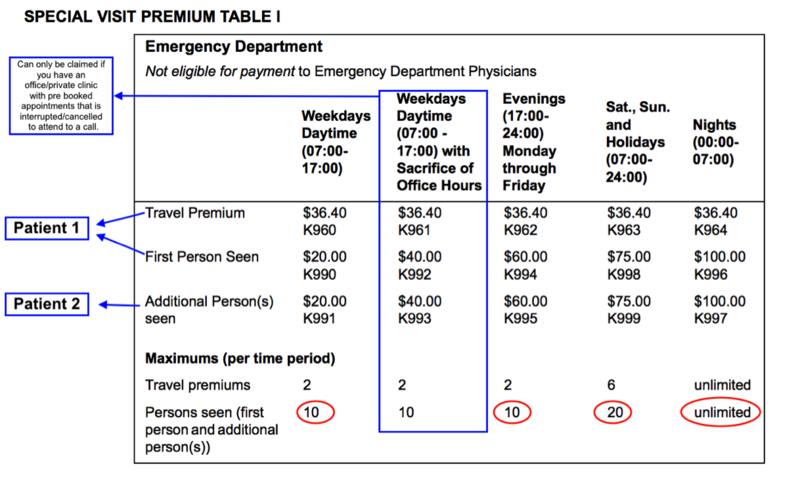 Travel Premium — applies when you travel from any place other than the hospital where the service is performed. First Patient Seen — applies to your first patient seen. *If your shift spans past midnight, you can bill another ‘first persons seen’ for that new day. 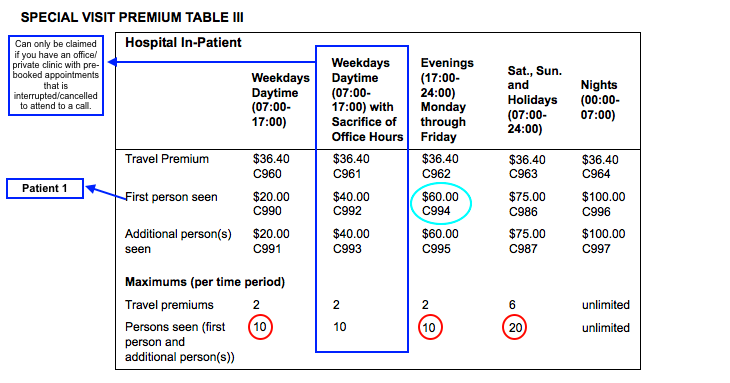 Tip If Dr. Apple admits either patient, he can also add the E082 Admission Premium to these claims. * A travel premium is not applicable in this instance, as he is travelling within the hospital.